Kyle Busch survived a second lap crash to take his eighth NASCAR Cup series win at Bristol. The Joe Gibbs Toyota driver led home brother Kurt Busch, having made the call to stay out while his nearest challengers pitted for new tyres during a caution period in the final 20 laps. 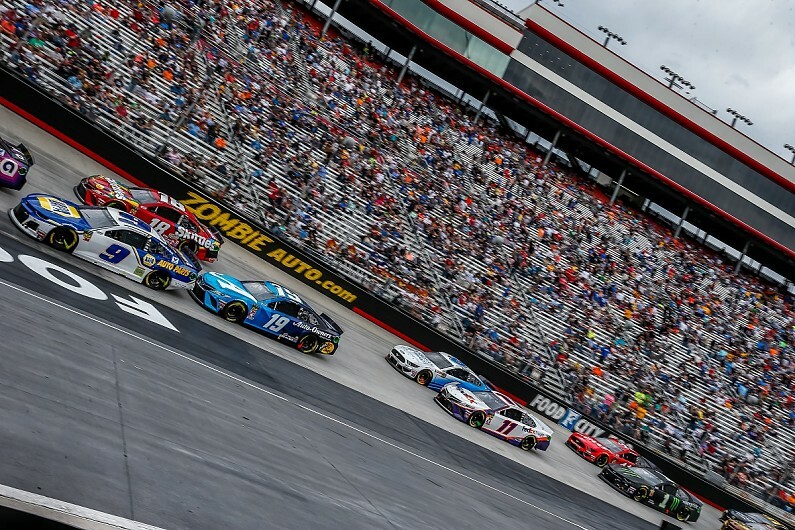 Busch, who has more wins at Bristol than any other active driver, was caught up in a second lap collision which was caused by front-row starter William Byron getting loose and collecting Aric Almirola. Behind them Busch came together with Ricky Stenhouse Jr. Despite being caught up in the pile-up, by lap 93 of the 500-lap contest Busch was back in the top 10, but it wasn’t until lap 381 when he took the lead of the race for the first time. His long-run pace up front was weak, however, and within 30 laps he was passed by both Clint Bowyer and Joey Logano. A caution period on lap 415 caused by Kyle Larson handed the lead back to Busch, who was promoted to first after leader Denny Hamlin was judged to have sped on pit road during the yellow flag period. Again Busch was unable to hold onto the lead for an extended period of time, being passed by the Penske pair of Brad Keselowski and Logano 10 laps after the restart. A final caution period on lap 479 proved pivotal, with both Logano, Keselowski, and the third Penske entry of Ryan Blaney all opting to pit for tyres, while Busch stayed out to gain track position. The call proved vital as Busch was able to hold onto the lead until the finish of the race. Runner-up Kurt Busch came close to beating his younger brother, but a brush with the wall with four laps to go ended all hopes of him winning. Stage 2 winner Logano finished third and was making good use of his fresh tyres at the end of the race but ran out of time to mount another challenge for victory. Blaney, who set the all-time track record in the second qualifying session, led a race-high 158 laps, finished fourth. He remains the driver with the most laps led without a win this season. Hamlin rallied back from his penalty to score his fifth top-five finish of the year. Paul Menard was sixth, one spot ahead of Clint Bowyer, who had a fast car, but contended with handling issues for much of the day and caused the penultimate caution of the day after his front right tyre went down. Daniel Suarez, Ryan Newman, and Jimmie Johnson rounded out the top 10. Pole sitter Chase Elliott just missed out on a top-10 finish in 11th, with Matt DiBenedetto finishing a strong 12th. Kevin Harvick, who had to start at the back of the field and take an early drive-through penalty after his car failed inspection three times before the race, finished 13th. Ty Dillon, who took a surprise Stage 1 win after a photo finish with Bowyer, wound up 15th. Keselowski, who was a front runner for much of the race and led 40 laps, was classified 18th and a lap down after being handed a late-race penalty for ignoring restart instructions.